The new Lenovo Tab 7 Essential and Tab 7 are both 7-inch tablets with quad-core MediaTek processors under the hood that come with Android 7.0 Nougat out of the box. These slates can be acquired in the US for less than US$100. When it comes to the big brands that still sell Android tablets, Lenovo reigns supreme in the sub-US$100 market. Although Samsung and Apple continue to come up with new tablets on a regular basis, none of them is bothering with low-end devices. Lenovo's new Tab 7 Essential and Tab 7 are now available for purchase in the US and they both target buyers on a very tight budget who just want a compact WiFi-only Android tablet and nothing more. The specs of these two 7-inch tablets are almost identical at first sight, but there are a few minor details that set them apart. First, there is the cheaper Lenovo Tab 7: MediaTek MT8161 processor, 1,280 x 720 pixels, 5 MP front camera, Dolby Atmos audio. 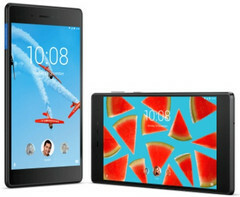 The Lenovo Tab 7 Essential is powered by the MediaTek MT8167D processor, its display has only 1,200 x 600 pixels, and the front camera only has a 2 MP sensor. The list of common specs and features includes a 2 MP camera on the back, Google's Android 7.0 Nougat mobile operating system, 1 GB RAM, 16 GB internal storage, as well as WiFi and Bluetooth connectivity. There should also be GPS support and a micro USB connector for charging and data transfer, but those are not mentioned in Lenovo's official product pages. The new Lenovo Tab 7 and Tab 7 Essential only come in black and promise to deliver an excellent battery life (15 hours for the Tab 7 and 20 hours for the Tab 7 Essential). Those interested in these two new Android tablets can purchase them directly from Lenovo's US online store. The Tab 7 has a price tag of US$99.99, while the Tab 7 Essential retails for just US$79.99.